This quality 8.5 x 11 sheet is printed with ink-jet, fade-resistant inks, on professional heavyweight paper. Step-by-step instructions are included. The Heureux Noël Miniature Nativity at home on the miniature wire-and-beads Crèche Tree. I've been cutting and pasting these quality 8.5 x 11 ink-jet printed sheets to decorate my Miniature Crèche Tree (shown at left) with the Heureux Noël Miniature Nativity front and center. 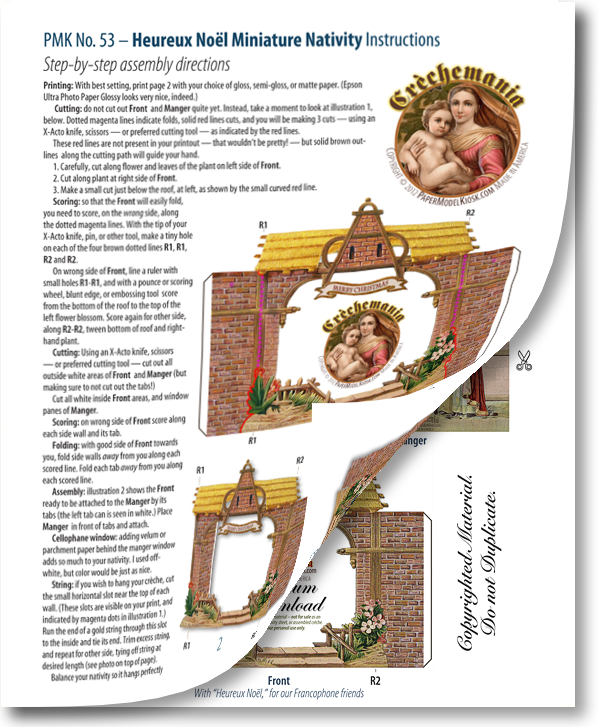 This quality 8.5 x 11 ink-jet printed sheet — fade-resistant inks on heavyweight professional media paper — is accompanied by a PDF of step-by-step assembly instructions to make assembly of the Heureux Noël Miniature Nativity easy. Buy Heureux Noël Miniature Nativity Sheet as part of a collection, and save!